How do you guys think it will hold up on my frame, withstanding heat and all. Does anybody have any experience with this stuff on their bike? Any info would be appreciated! Thanks! I haven't used the 3M stuff, but I recently wrapped my clocks, clock surround panels, and tank trim panels in carbon fibre vinyl and it looked sweet as. The only problem I found was that if you apply heat to the vinyl to make it stretch to difficult shapes when applying it, when it gets hot again (say, leaving it in direct sunlight for 8 hours whilst at work) it can shrink back a bit. That was only at the really tight areas. It could also melt/sag quite a bit if attached to the frame as I know it can run a little on the warm side. I'd suggest getting a sample from somewhere, most companies will send you one for free, approx 100mm square and stick it to the frame where it gets warmest and have a look-see what happens. also attach it to complex curves as well. Not the best picture in the world, but should do the job. Yeah, nice looking mod. Mind giving a brief description of your process? On a related tip, I've been considering the endeavor of using my existing bodywork, fenders, random parts, etc. as molds over which I can lay carbon fiber and make slightly larger (but hopefully still fit-able) cf replacements that will shed weight, look cool and give me something to do on my goof-around time. Do You Folks think it would unfeasible for any reason? Would the fitment be a major issue even if the size of the cf part was only slightly off? 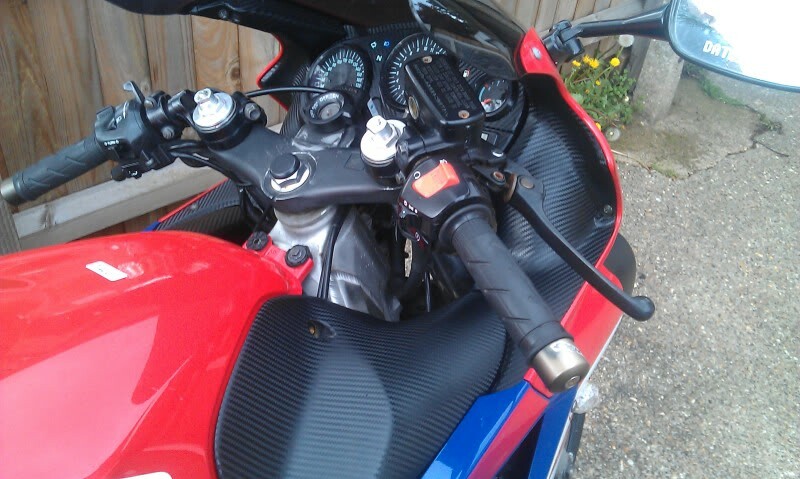 I suppose that would depend on the part I'm replacing, but lets take, for example, two parts: a broad, mostly flat part such as a side fairing and a smaller but more complex part such as a front fender, or the instrument panel cover. What would be the weight reduction, approximately, of a side fairing made of cf? Would the front fender be such a complex shape that the slight difference in size would make it difficult to fit? I feel like it would be pretty simple to just shift the holes for mounting slightly. Sorry to totally highjack your thread (mods, I'm 100% cool with pasting this all into a new one if you'd prefer). On a related tip, I've been considering the endeavor of using my existing bodywork, fenders, random parts, etc. as molds over which I can lay carbon fiber and make slightly larger (but hopefully still fit-able) cf replacements that will shed weight, look cool and give me something to do on my goof-around time. Do You Folks think it would unfeasible for any reason? The parts will be oversized so in my opinion no good. Cover the stockers in fiberglass to make a mold, then lay carbon fiber inside the fiberglass to make parts. Presto! They are the correct size again. Has anyone used the 3m carbon fiber wrap?? Quick Reply: Carbon Fiber wrap!